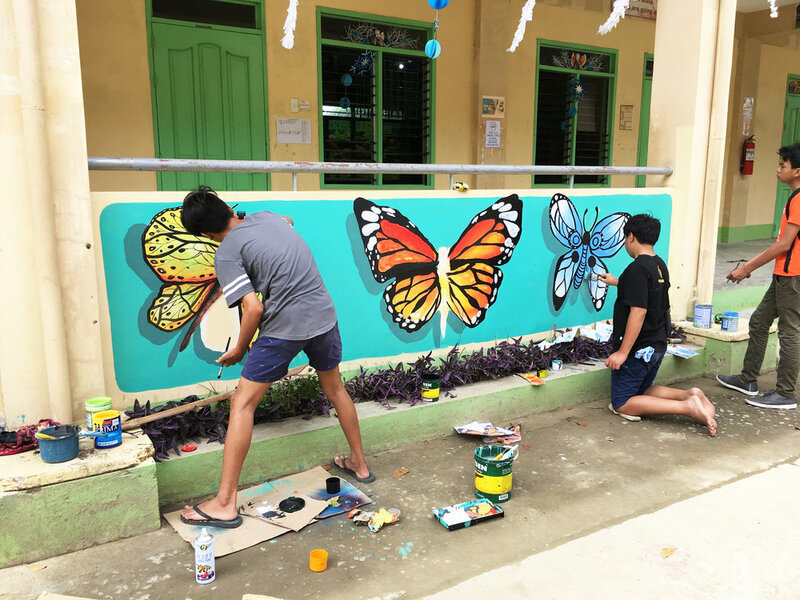 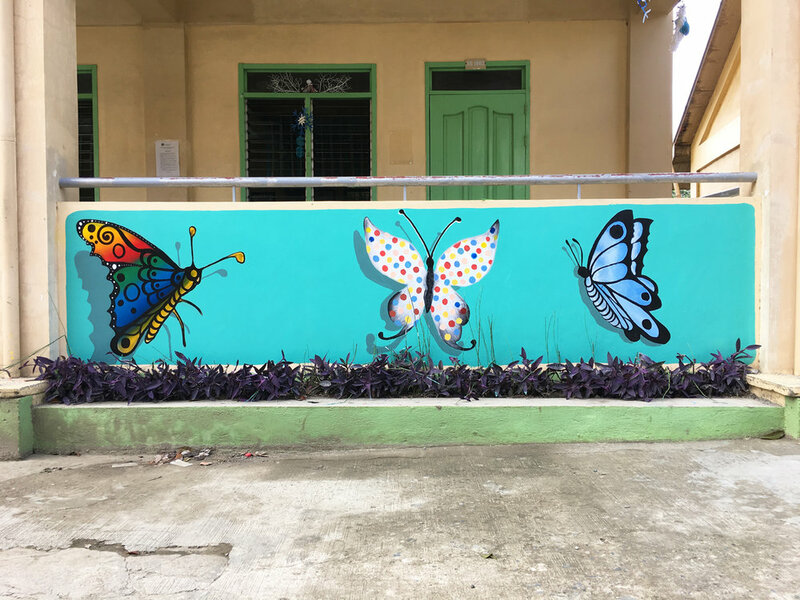 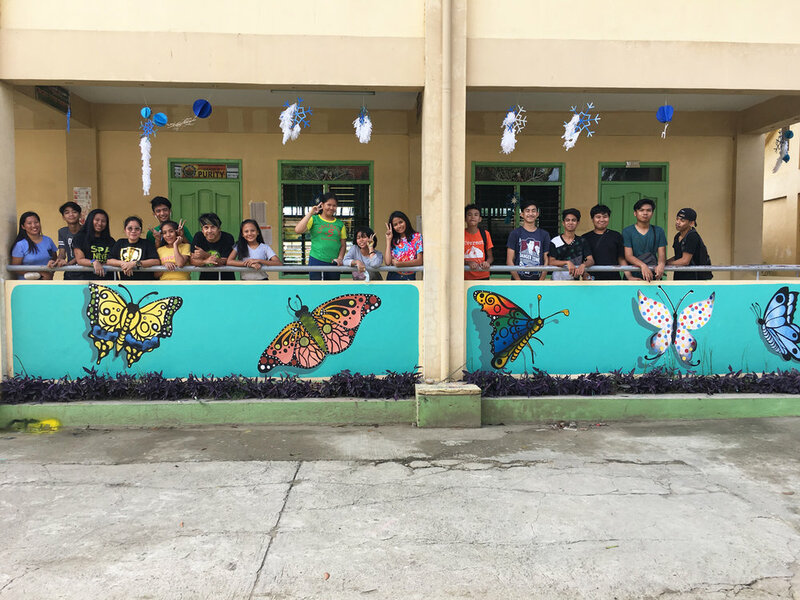 Freestyle Butterfly Strokes is a four-part collaborative mural painted with seventeen students from Pavia National High School. 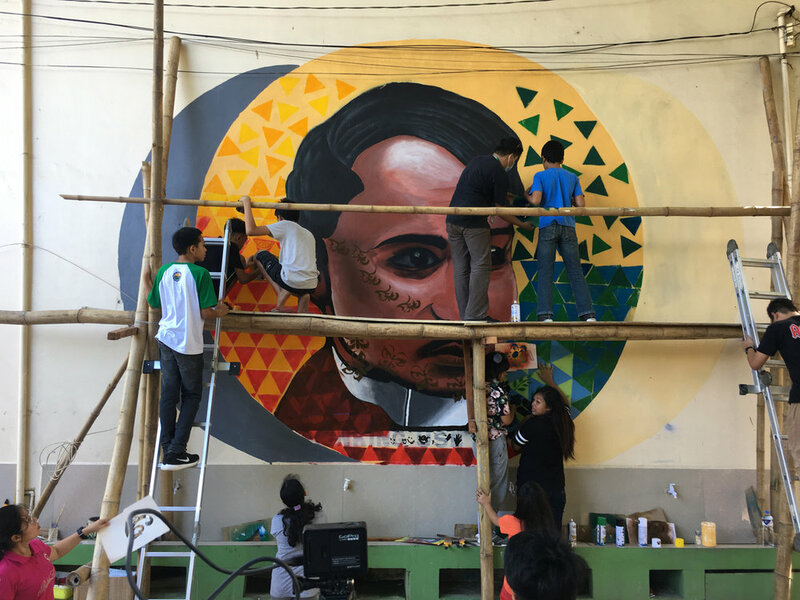 The José Rizal Mural Project was initiated during a visit to the Pavia National High School (PNHS) in 2017 with a promise of returning the following year for a large-scale collaboration between FHN and PNHS students. 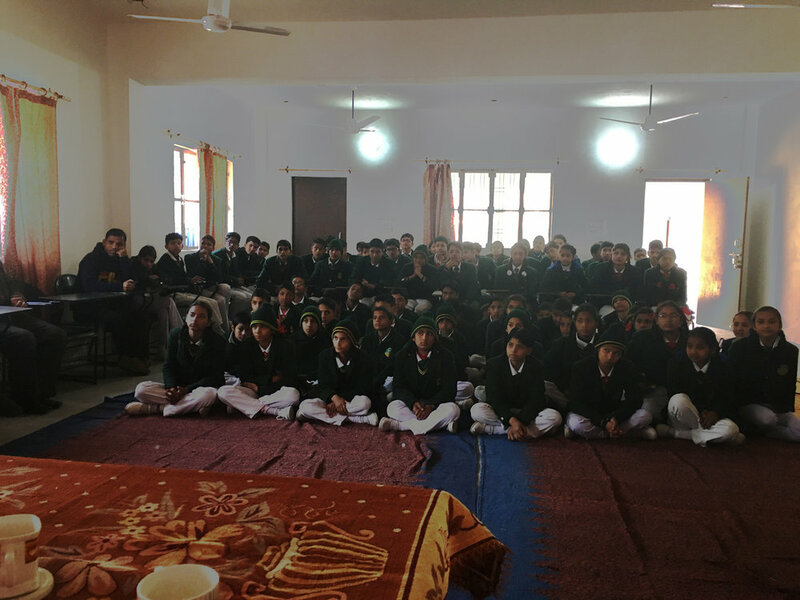 The project commenced exactly one year later with an orientation featuring a slide show and a lecture. 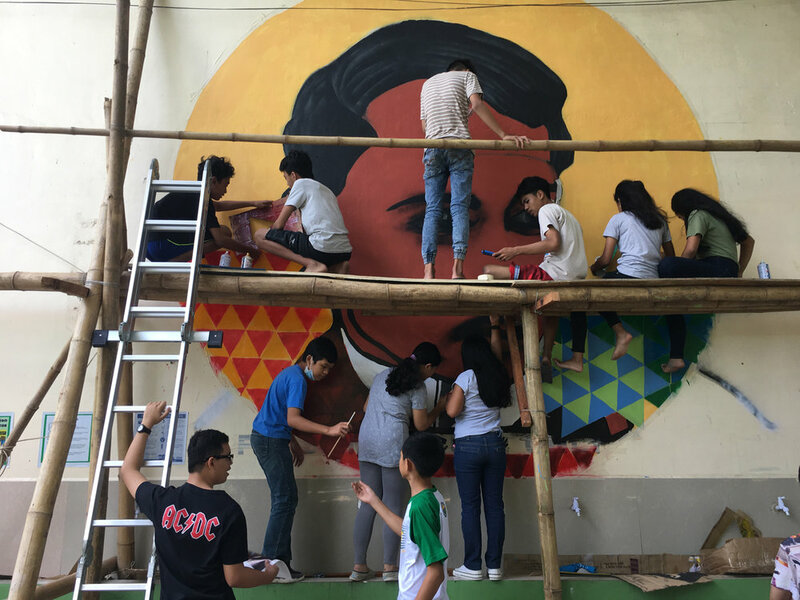 The mural is a depiction of José Rizal, a Filipino nationalist and polymath who lived a brief life at the tail end of the 19th century as he was executed by the Spanish colonial government for his political influence. 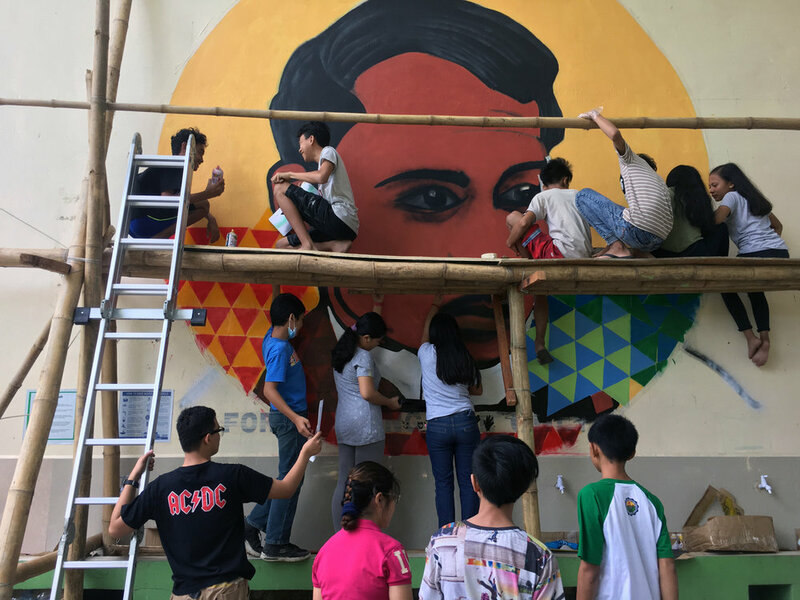 He is widely considered one of the greatest heroes of the Philippines. 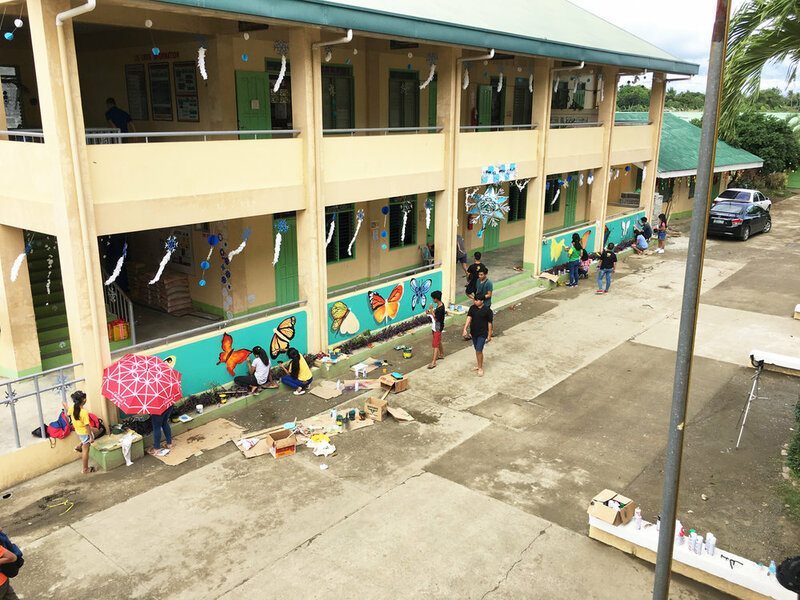 The project grew organically as thirty students in grades 7 through 10 engaged in improvised techniques, such as creating a large-scale compass tool out of fishing line and a pencil; blending and scumbling using brushes and latex; and stenciling using scrap cardboard and spray paint. 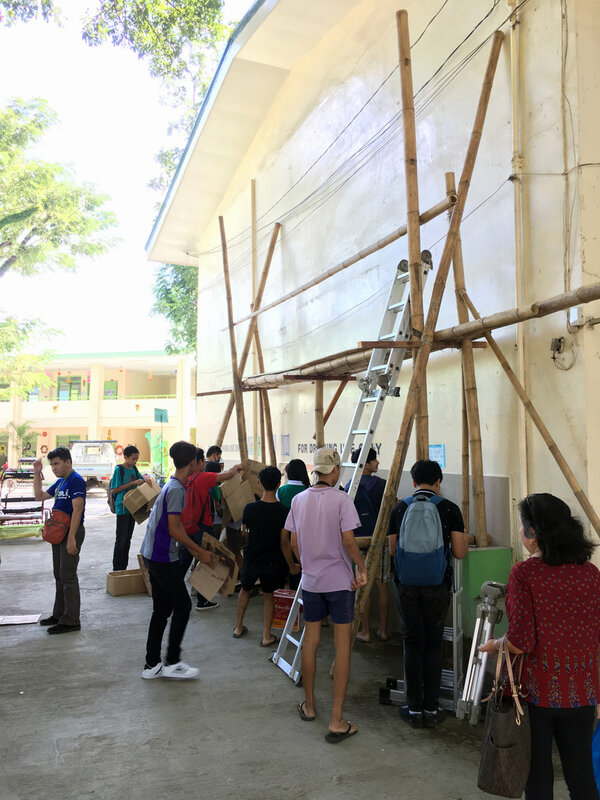 And check out the bamboo scaffolding that was assembled for us by a nearby construction crew. 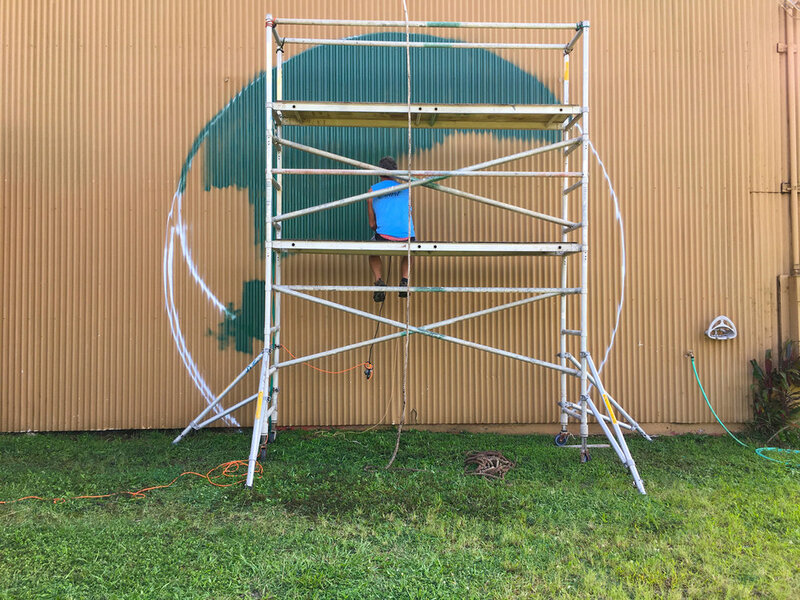 Laka, Goddess of Hula is a mural created in collaboration with community members at the Kohala Artists’ Cooperative located on the northern tip of the Island of Hawai’i. 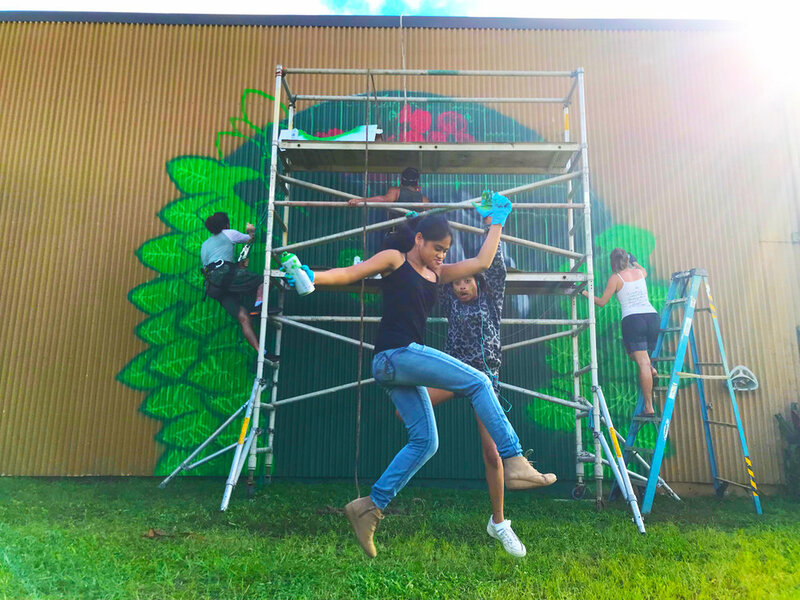 The mural project was blessed at the onset by Kahu Kealoha Sugiyama during an opening ceremony, and concluded a week later with a beautiful hula performance by Hula Halau O Mana’olana O Kohala. 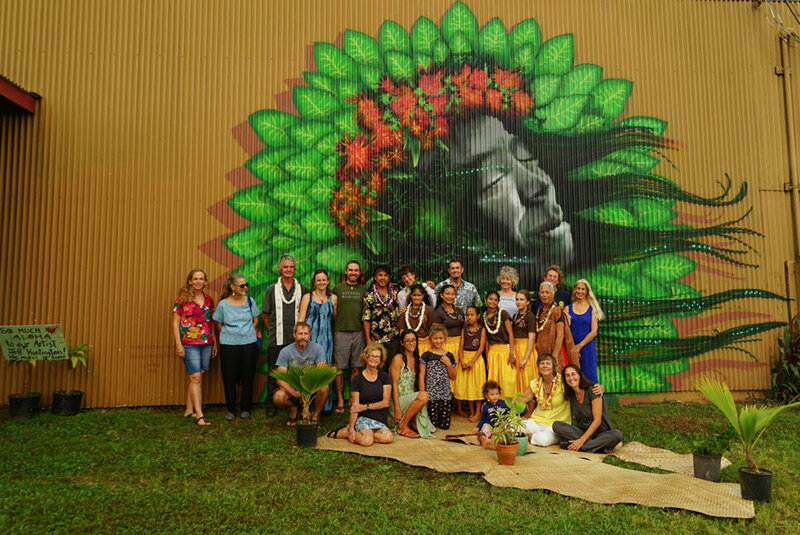 The mural portrays Laka, who is a goddess of hula, framed by a halo of taro leaves. 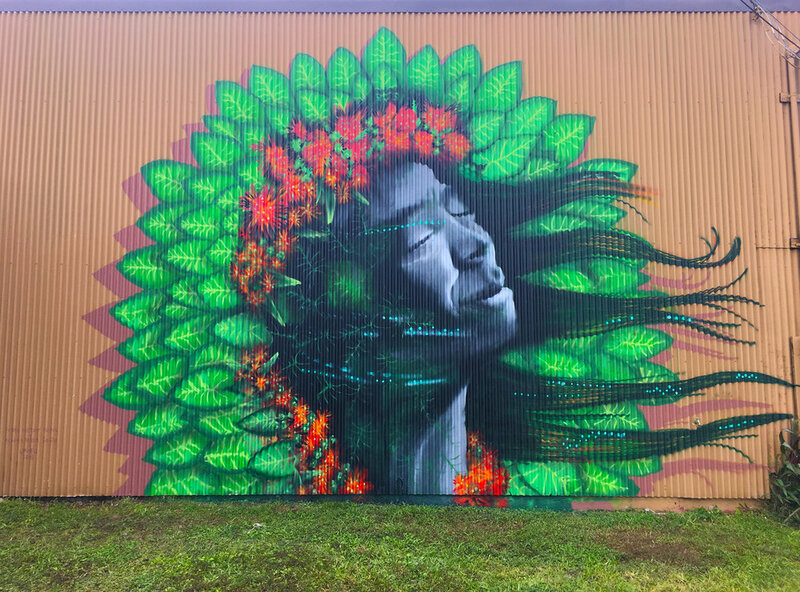 Her hair is shown flowing, depicting the constant winds of Kapa’au. 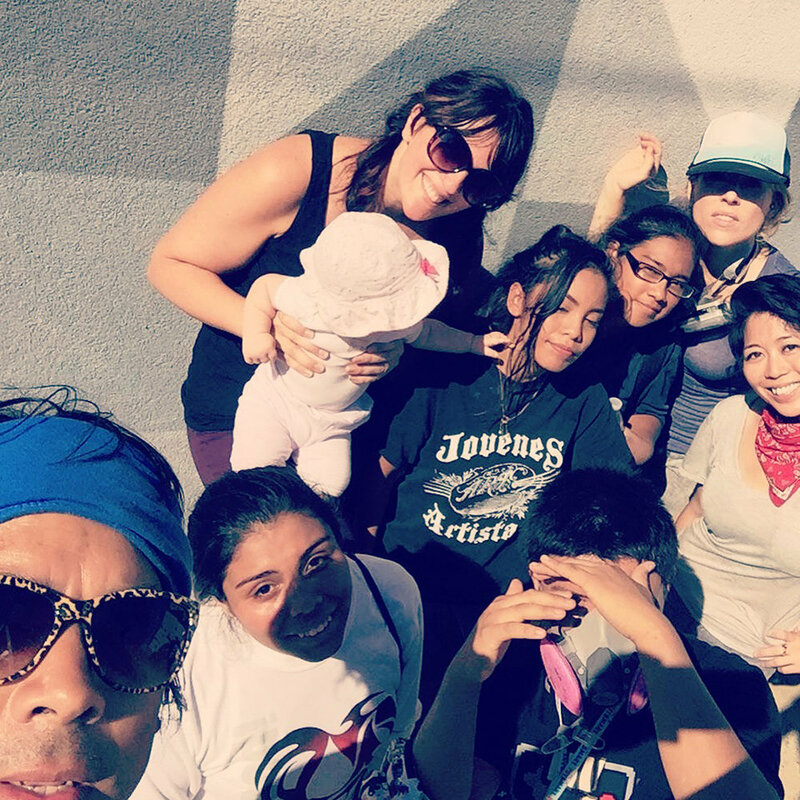 She inspires the hula dancer. 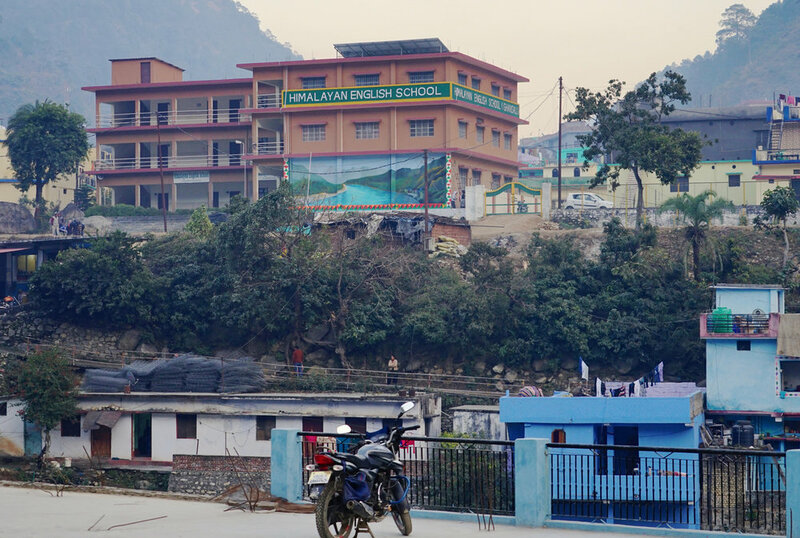 Laka is also credited as a goddess of the forest. 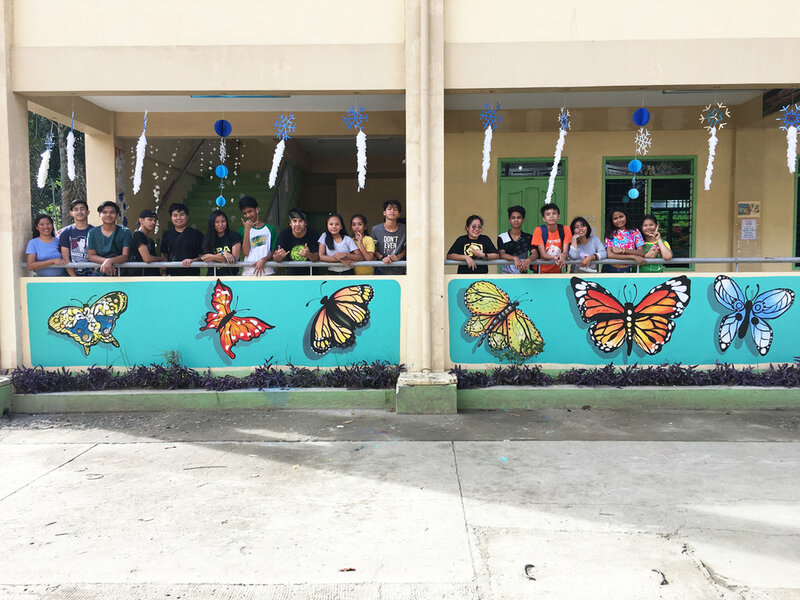 She makes the forest grow and thrive. 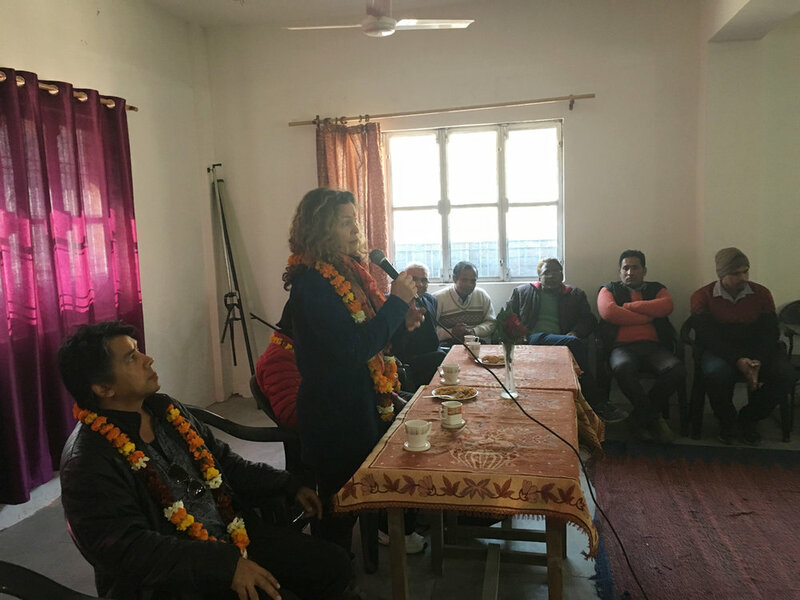 We must show respect and ask for entrance into the forest, which is Laka’s realm. 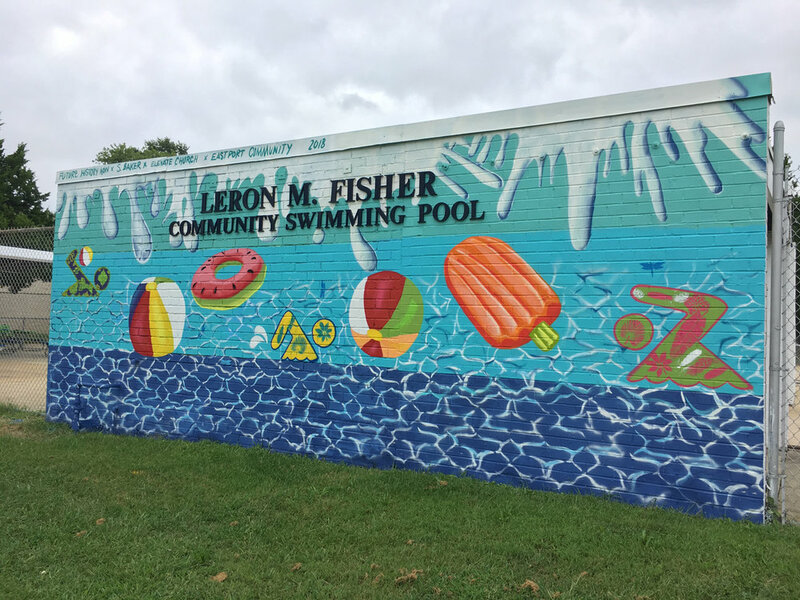 Pool Party Mural Project was a continuation of a series of art projects created throughout underserved communities in Annapolis. 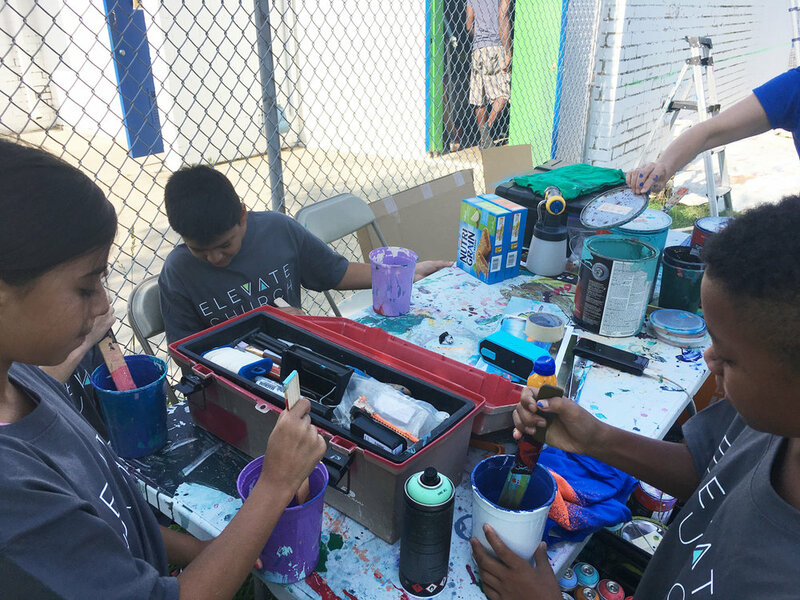 This particular project was in collaboration with kids from the greater Eastport community and Elevate Church, a local service program that engages youth in the community. 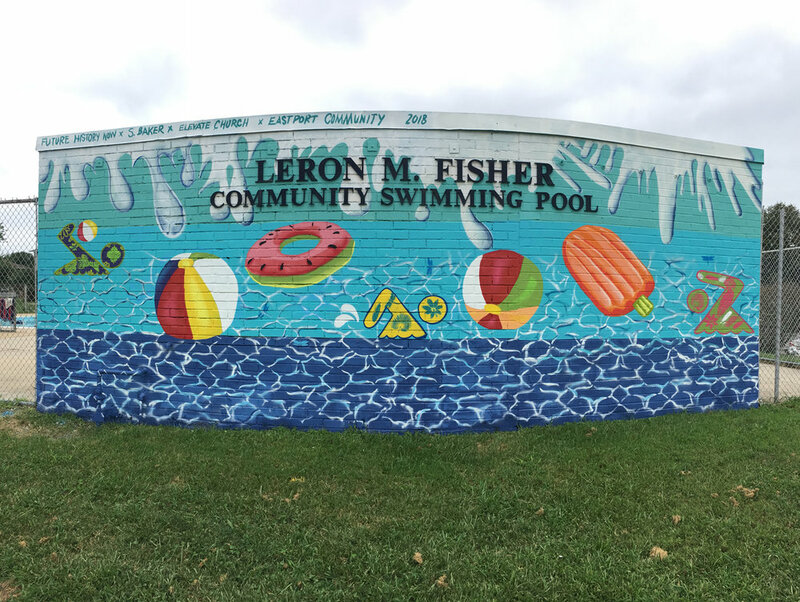 The Pool Party mural was designed by local artist Stephanie Baker, FHN’s featured lead artist for this project. 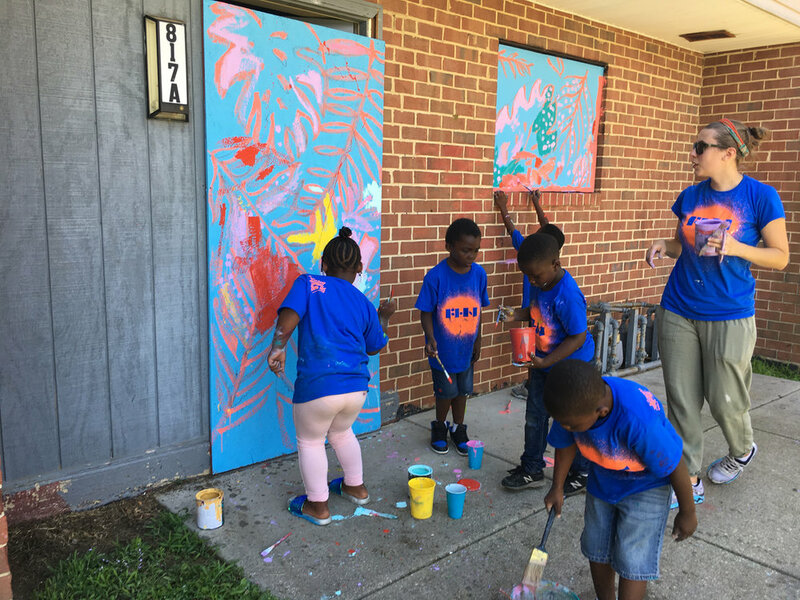 Dream Big Mural Project was a continuation of a series of art projects created throughout underserved communities in Annapolis. 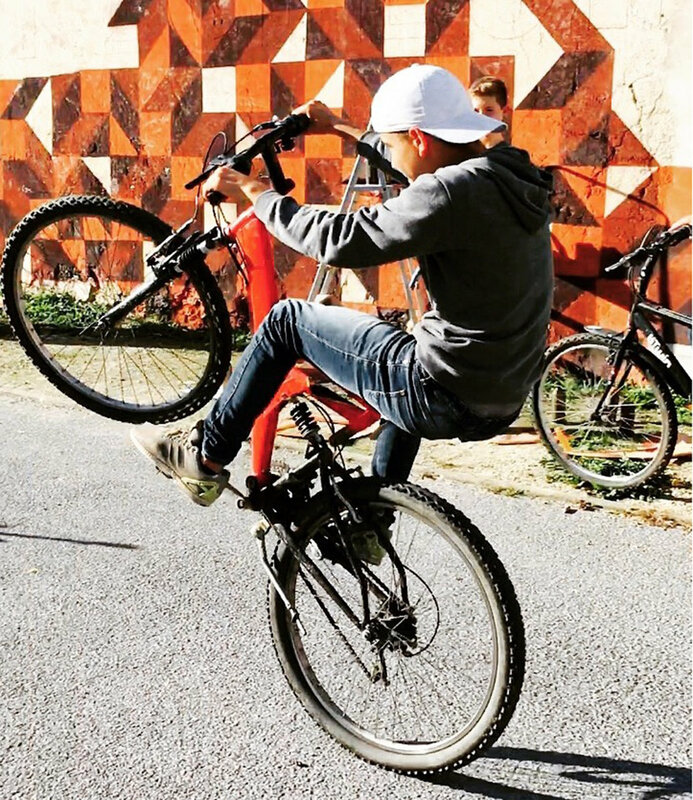 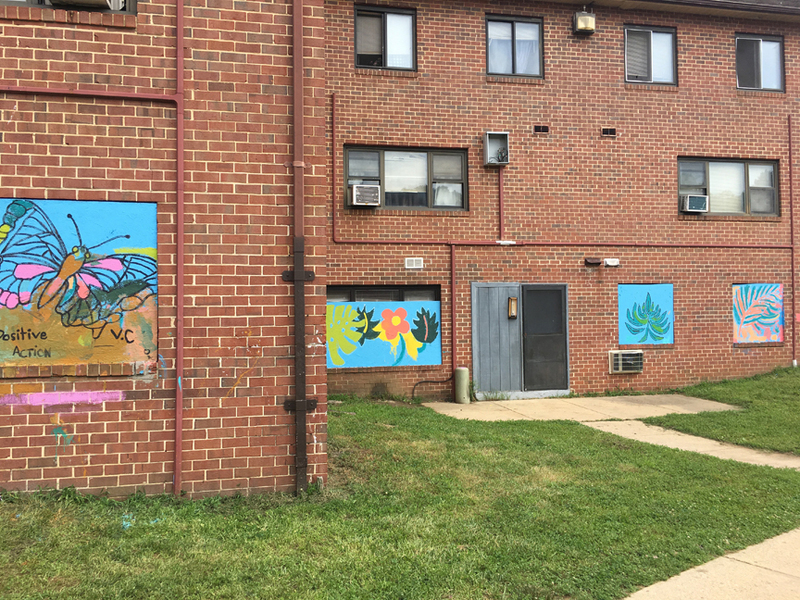 This art project took place within Newtowne 20, a public housing development in Annapolis. 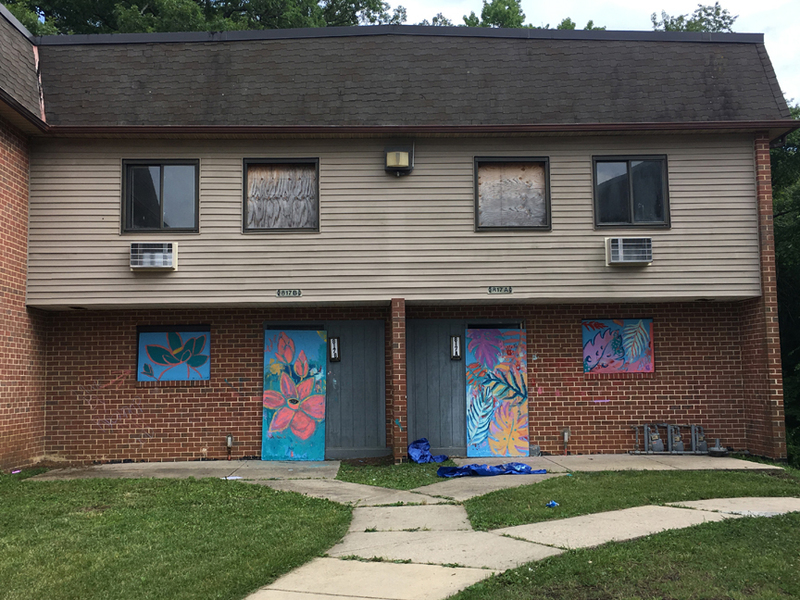 In collaboration with youth from the Newtowne 20 and Woodside Gardens communities, FHN painted murals on fifteen boarded-up doors and windows of abandoned apartment units along the street and playground where the kids of the community live and play everyday. 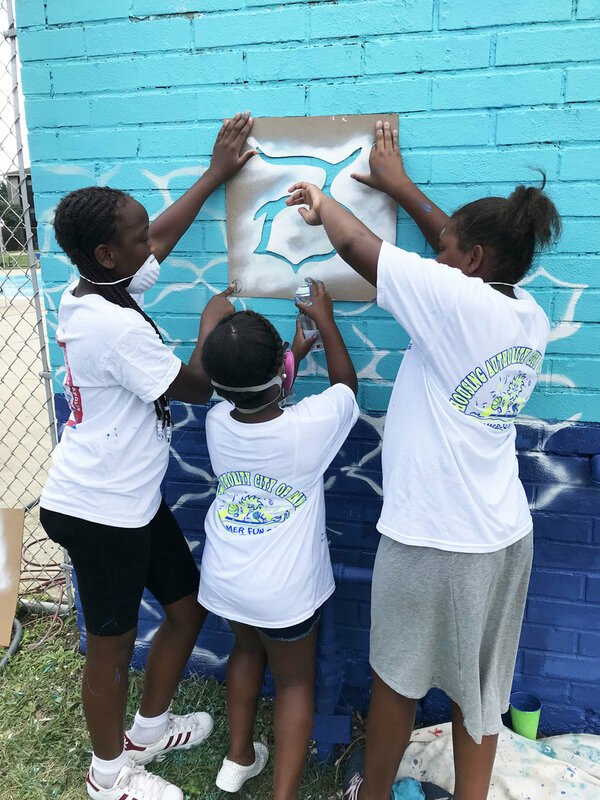 In addition to the smaller murals, a 32-ft. x 25-ft. mural overlooks the basketball court as a JumboTron, or a source of inspiration. 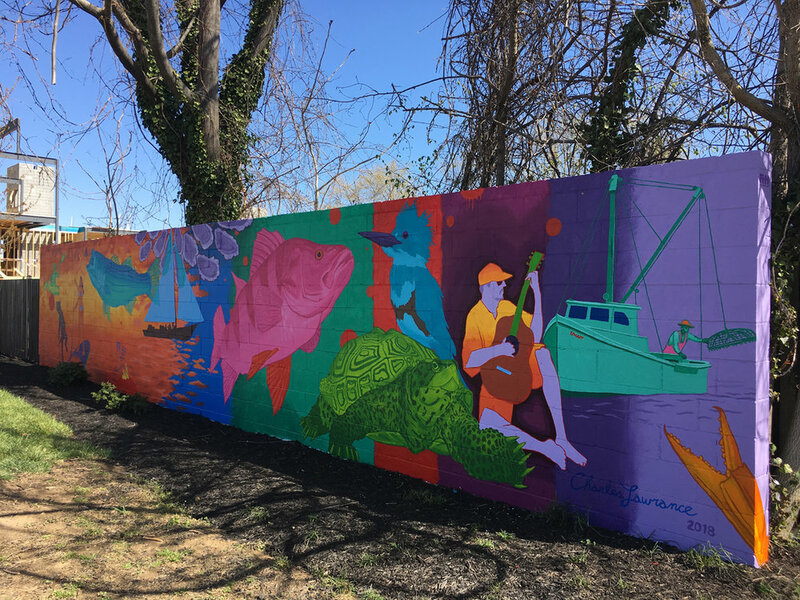 Pearl Bailey is the subject of a mural created in collaboration with George “Lassie” Belt and kids from the Stanton Community Center located in what is now Annapolis’ 2nd Ward, but will always be known by many as the Old 4th Ward. 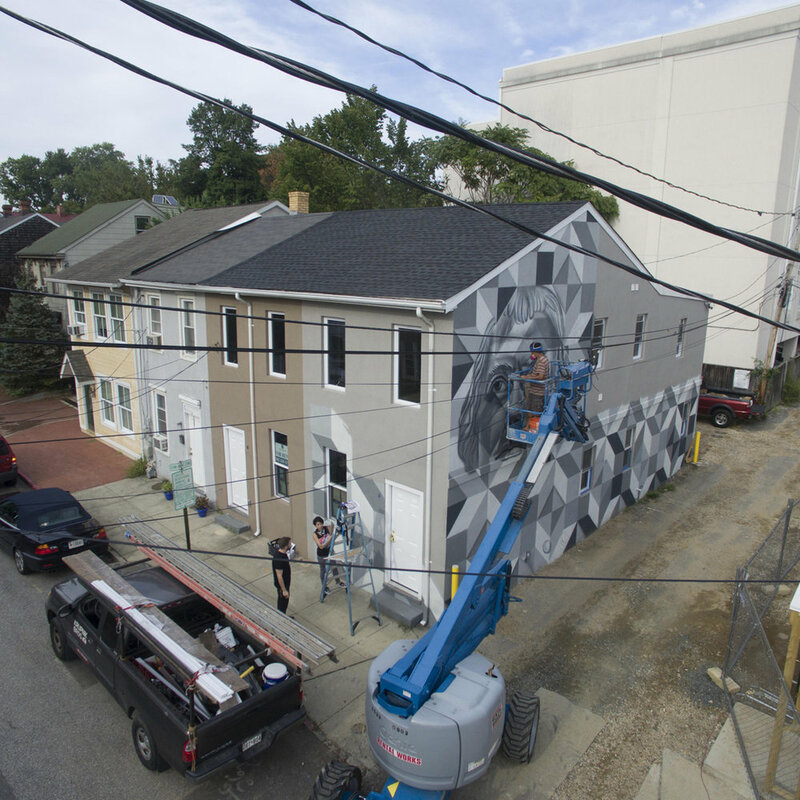 The mural is painted on the exterior of the Whitmore Parking Garage, which, during urban renewal and the civil rights movement, replaced 33 minority-owned businesses and numerous homes. 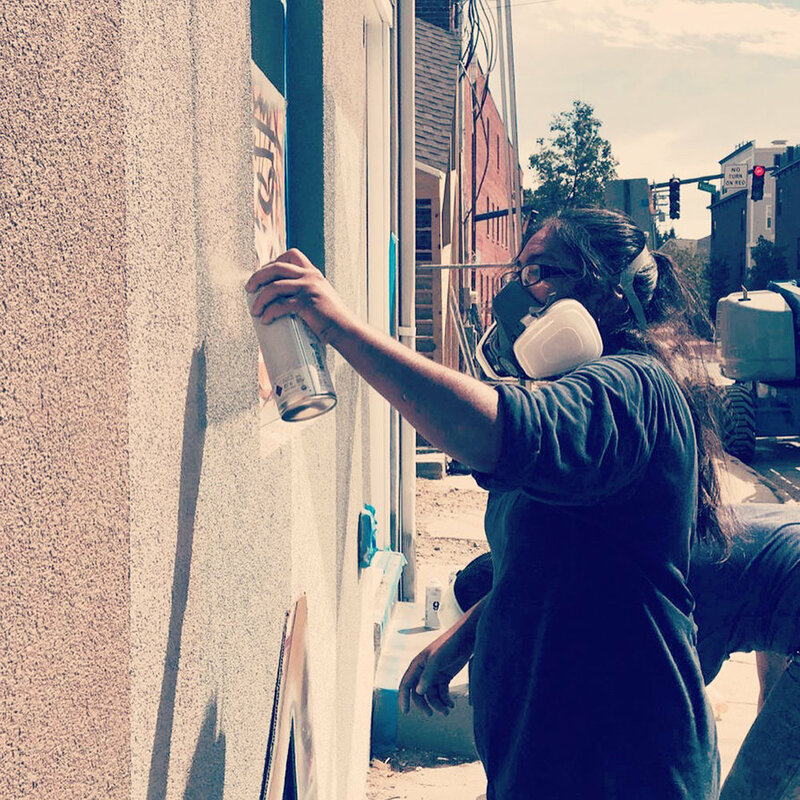 On this once-thriving block existed a number of entertainment venues such as Susie’s Tea Room, Dixie Hotel, and The Washington Hotel, where singers such as Pearl Bailey once performed. 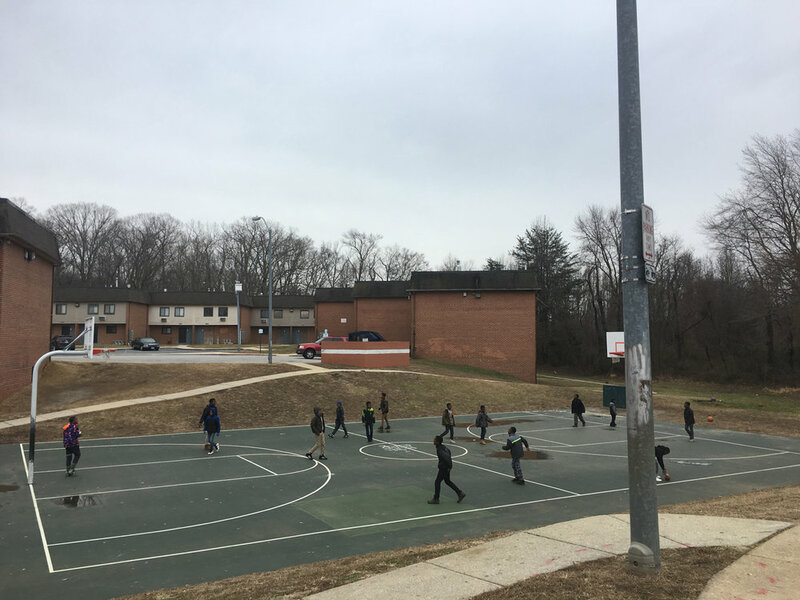 While this history is new to some of our young collaborators, older residents reminisced about having known Pearl Bailey or attended her performances in the old neighborhood. 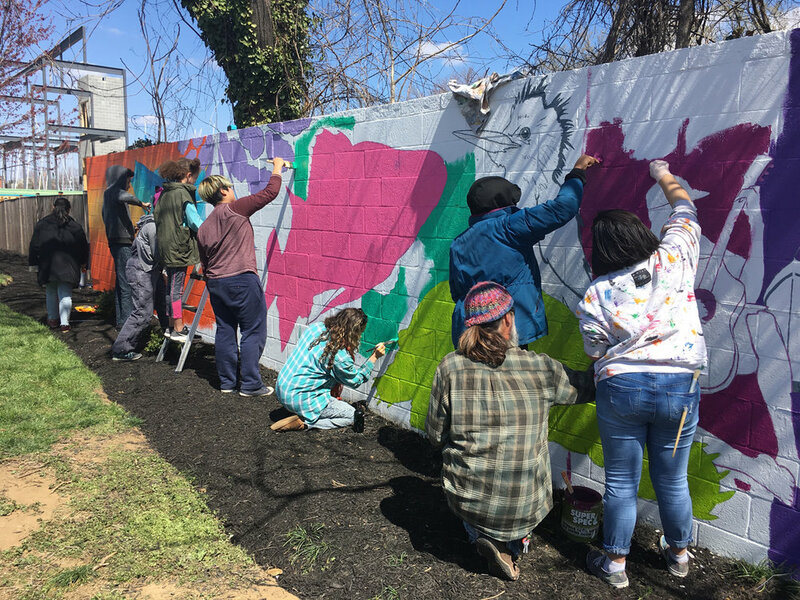 The MLK Mural Project kicked off a series of collaborative art projects created throughout underserved communities in Annapolis. 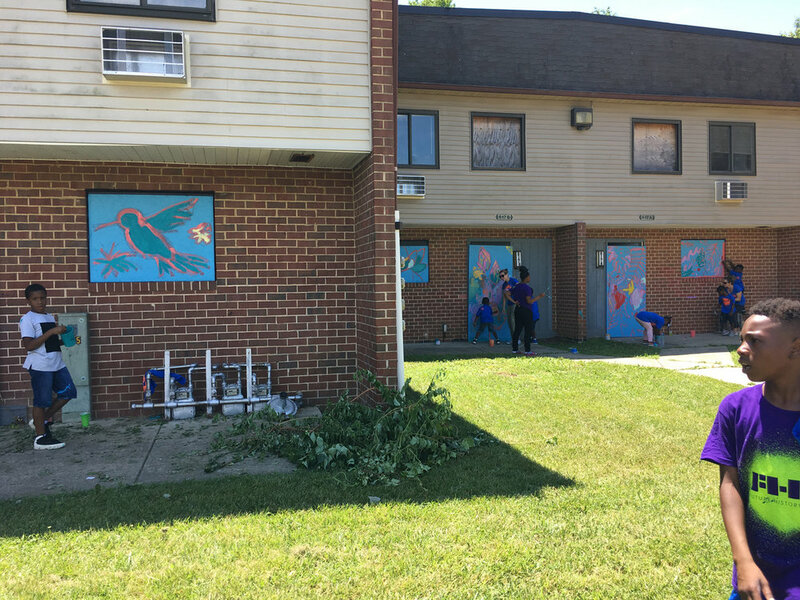 Located inside the Elizamae Robinson Community Center in Newtowne 20, the MLK mural was a collaboration between youth from the Black Wall Street Annapolis program, Newtowne 20 and Woodside Gardens. 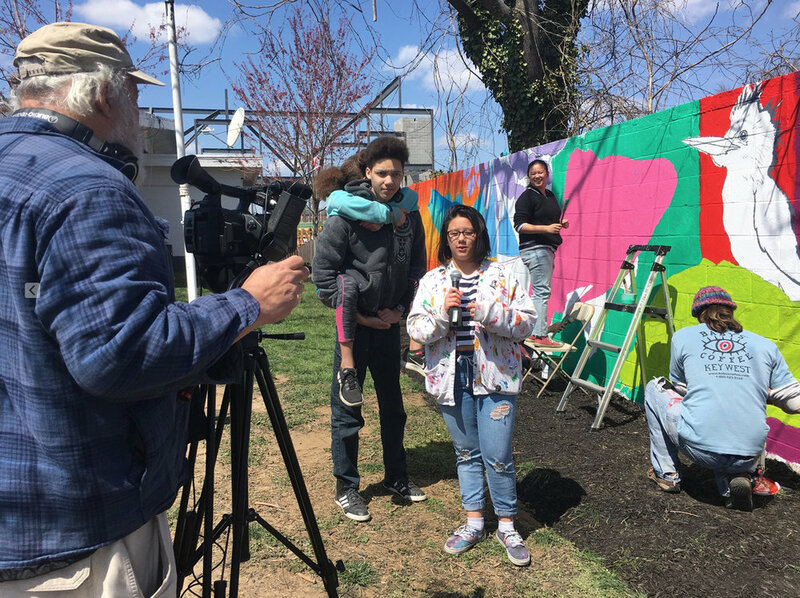 The young artists were encouraged to incorporate text into the mural, some of which represents “shout-outs,” or “call and response,” recognizing neighborhoods and programs involved, while other text are quotes from Martin Luther King Jr.’s “I Have a Dream” speech. 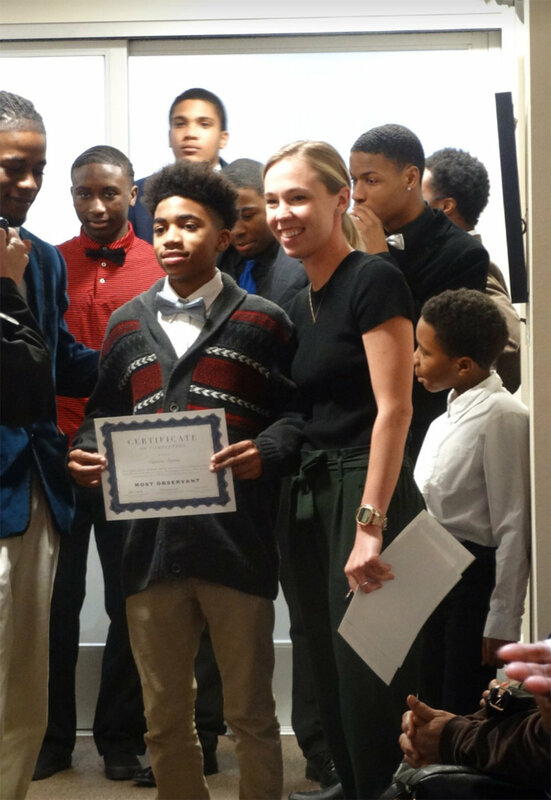 The programs represented are: Jóvenes Artistas, Black Wall Street Annapolis, Centro De Ayuda, Annapolis High Performing and Visual Arts and Bates Middle Performing and Visual Arts. 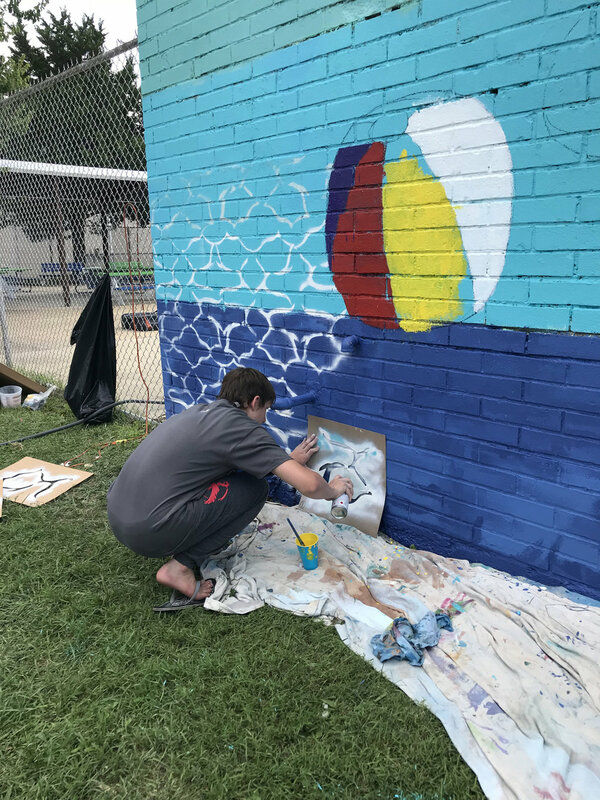 The Eastport Shell Mural Project was a collaboration between Charles Lawrance, our featured lead artist and concept designer, and youth from the Box of Rain, a local outreach program serving kids from surrounding underserved communities. 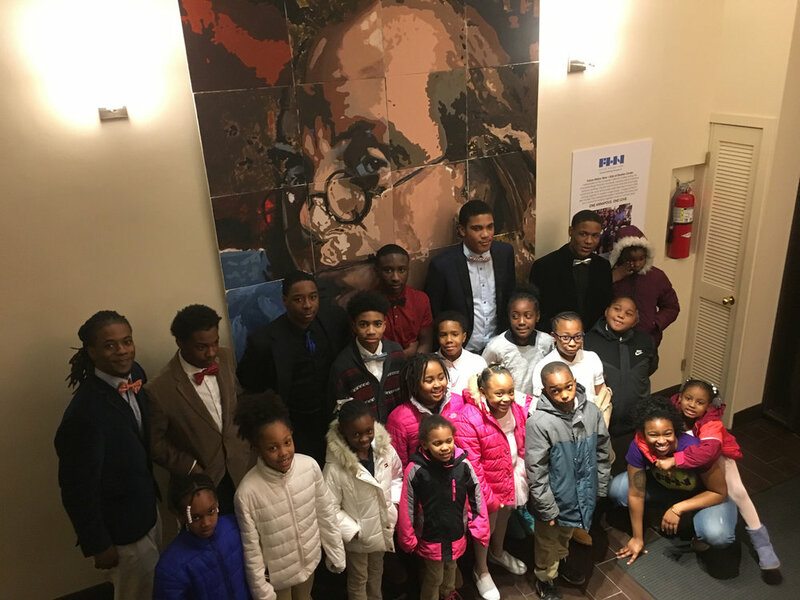 COLLAB: City Hall Exhibition and Council Chambers Tour was a collaboration between Black Wall Street Annapolis, photographer Allison Zaucha and kids from Stanton Center, Newtowne 20 and Woodside Gardens. 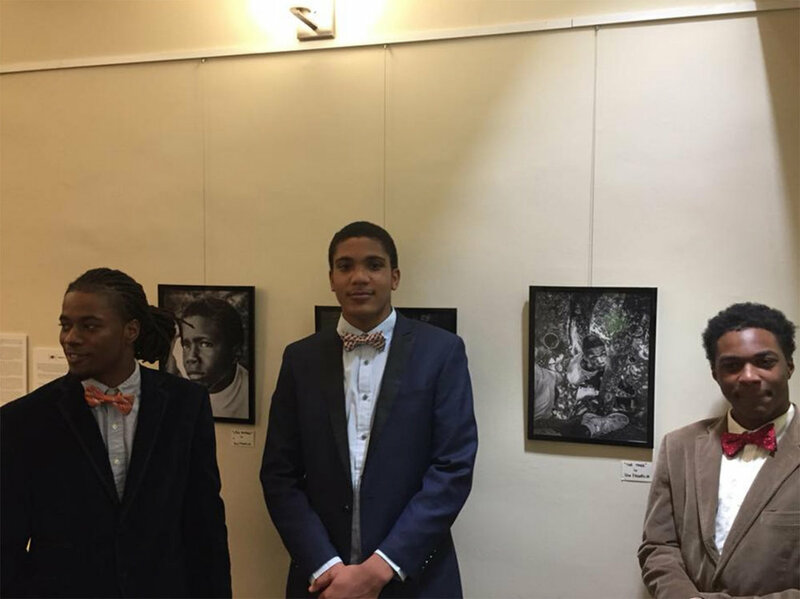 The exhibition featured a 20-panel painting created by the Stanton Center youth, which also hung as a stage backdrop at the Mayoral Inauguration the previous month; a photography exhibition by youth from the Black Wall Street Annapolis outreach program in collaboration with Allison Zaucha; and a tour of the City Council Chambers conducted by Mayor Buckley and local historian and Ombudsman, Janice Hayes-Williams. 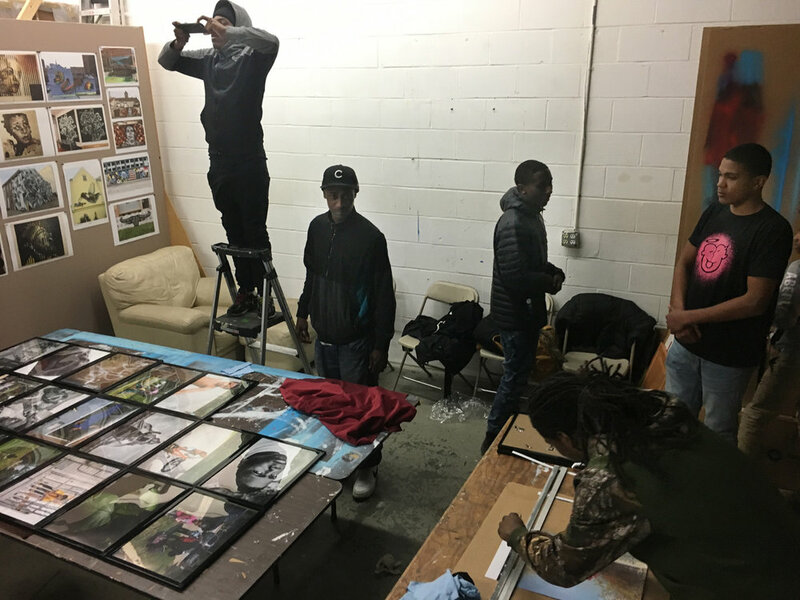 COLLAB: Print and Frame Workshop was a collaboration between FHN, Black Wall Street Annapolis and youth from Newtowne 20 and Woodside Gardens. 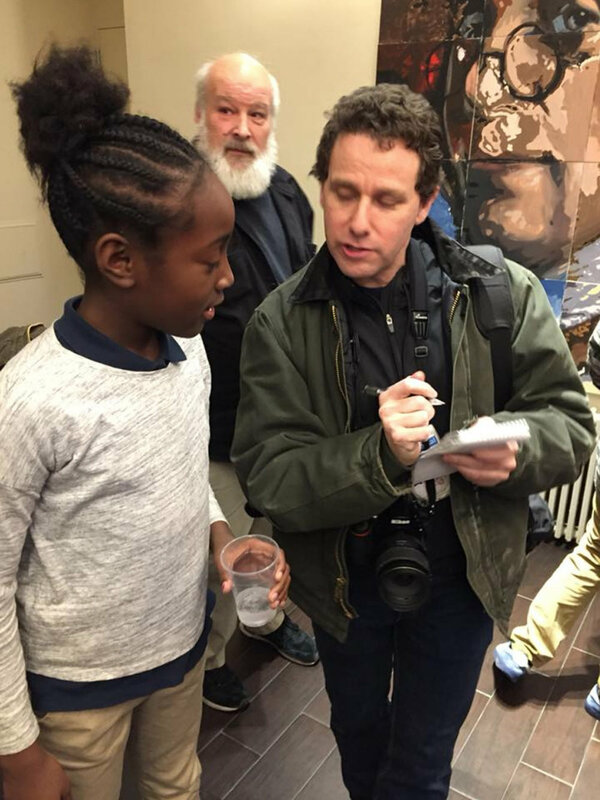 FHN worked with the budding photographers in the studio, teaching how to digitally print and frame their work. 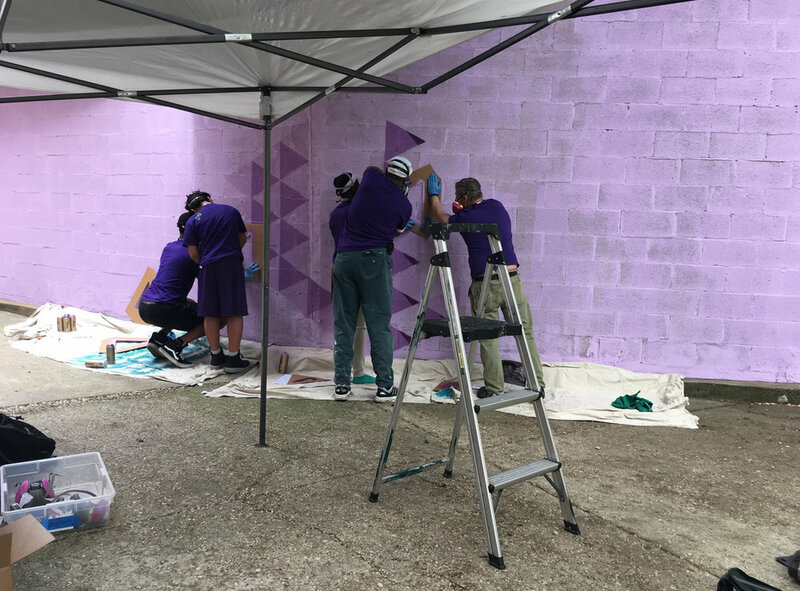 The results from this workshop were then mounted and exhibited at City Hall followed by a public opening reception and a private tour of the City Council Chambers. 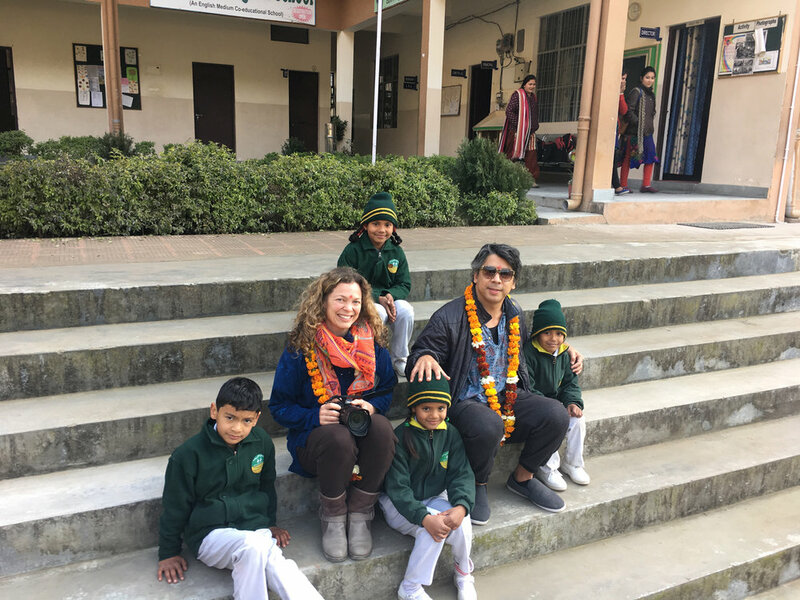 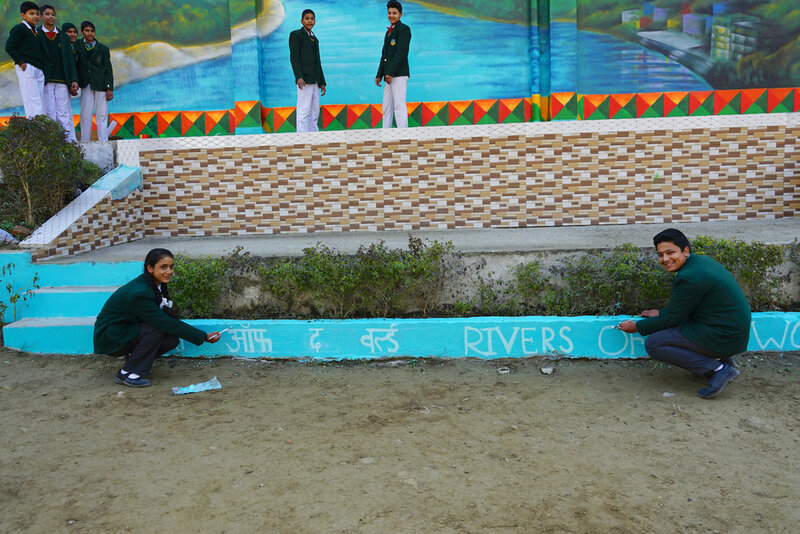 Sponsored by the Rivers of the World Foundation, FHN traveled to a remote village in the foothills of the Himalayas in northern India to paint murals with youth of the Himalayan English School (HES). 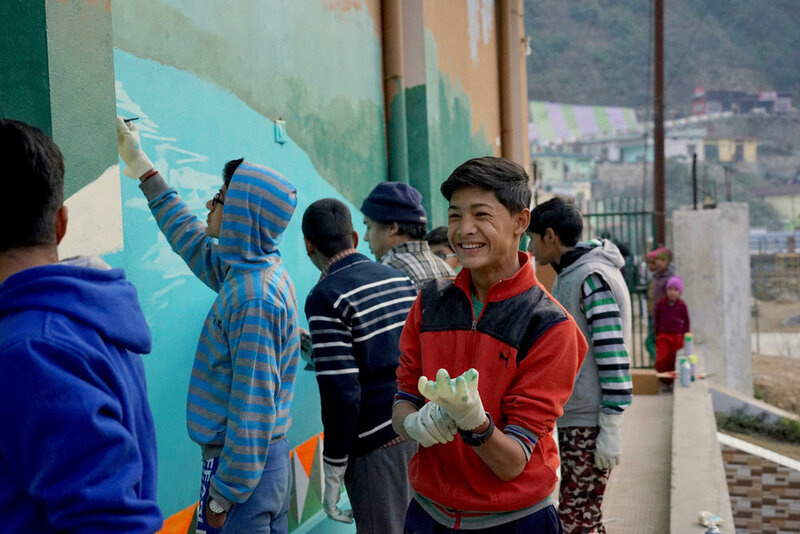 While engaged in the Ganga Mural Project, we bonded with our newest outpost community, deciding to return to Ghansali in 2019 to continue the collaboration. 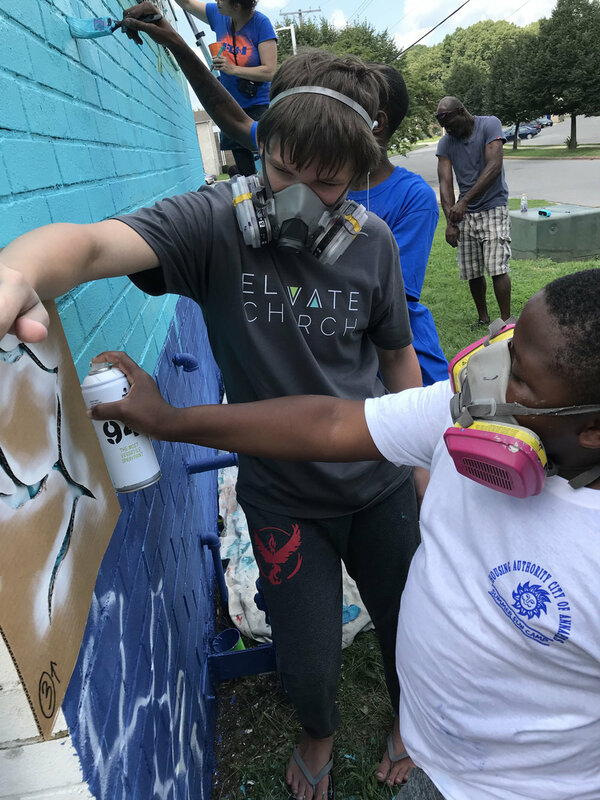 Future History Now collaborated with fifteen 6 to 12-year old youth from the Stanton Center in the creation of a multi-panel mural. 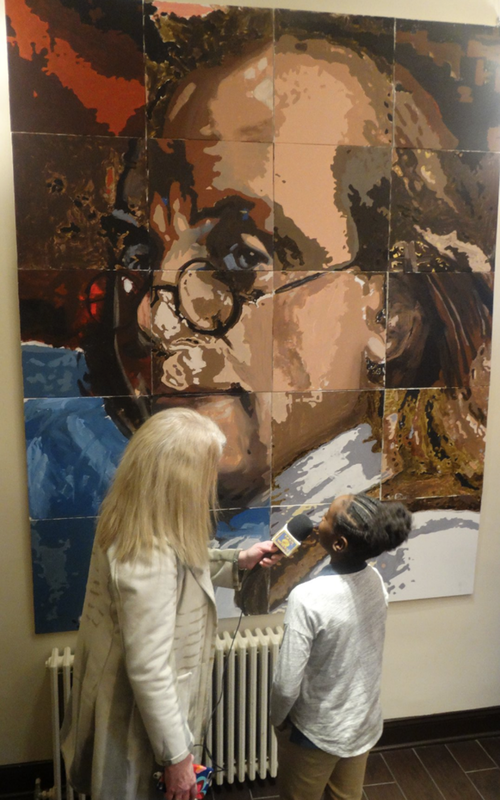 Each young artist was assigned with painting an 18x18 inch canvas. 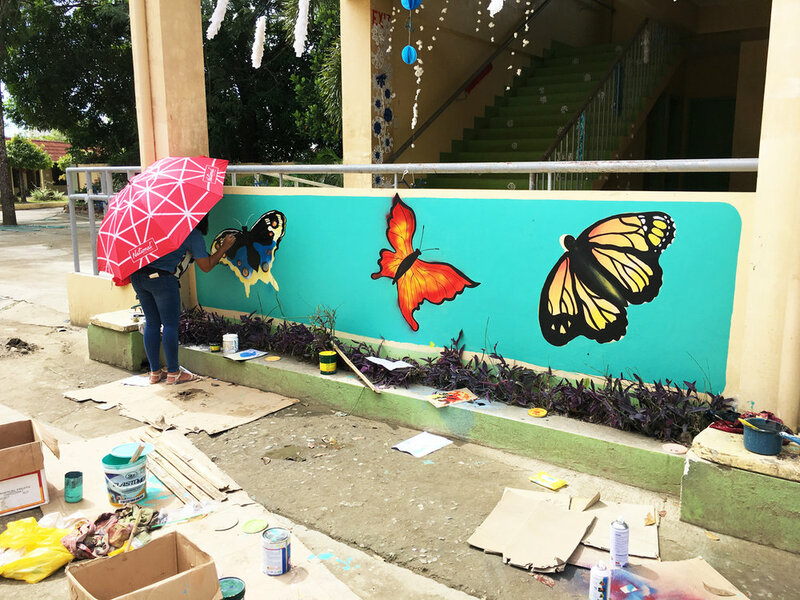 There were 20 canvases in all, each marked by a pre-drawn sketch by our team of artist-teachers. 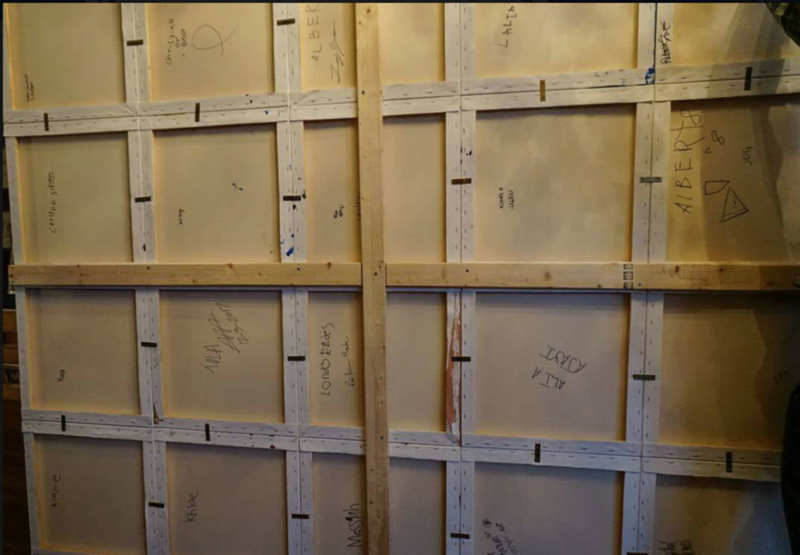 Each sketch represented a quadrant that, when screwed together in a particular order, depicted a realistic portrait of Benjamin Franklin. 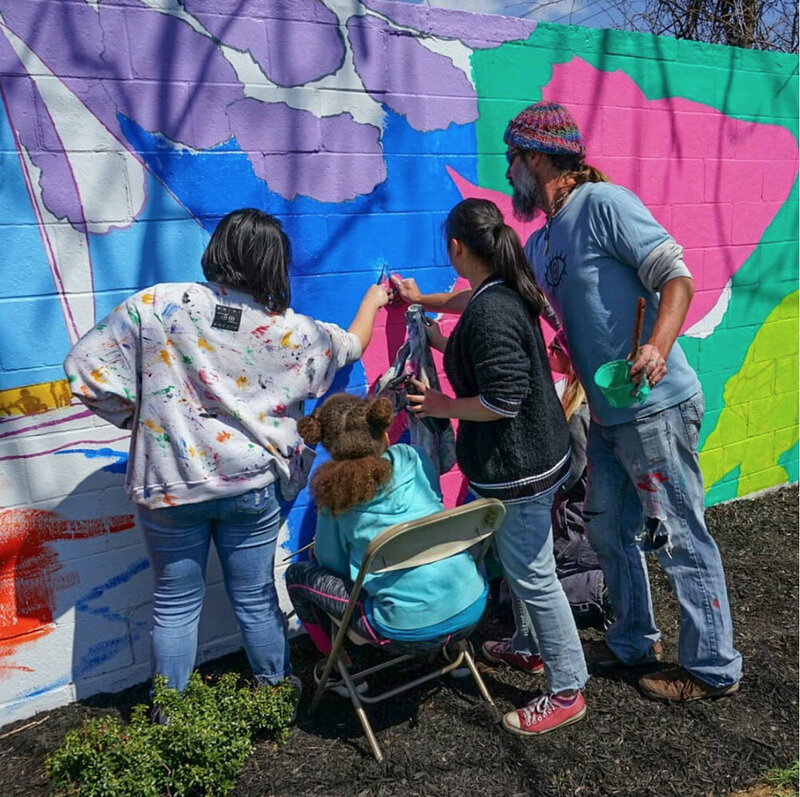 The youth had a vague idea that the assembled canvases would make up a single composition, but were unaware of the subject and the monumental presence the final painting would command. 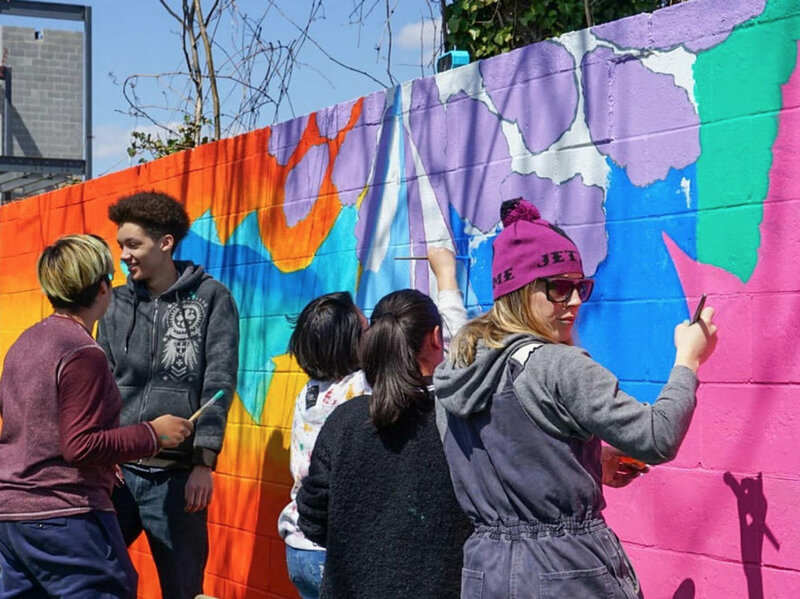 This painting represents many parts, or synechdoche, necessary in creating the whole - a community coming together for the common good. 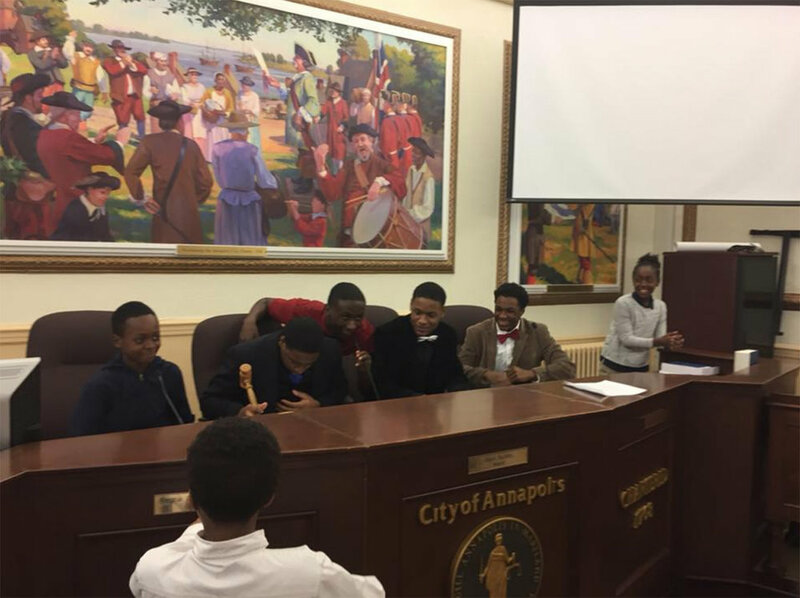 The final mural was hung on the stage during the Mayoral Inauguration on December 4, 2017, and then was exhibited in Annapolis’ City Hall during the month of Januray and Februarly , 2018. 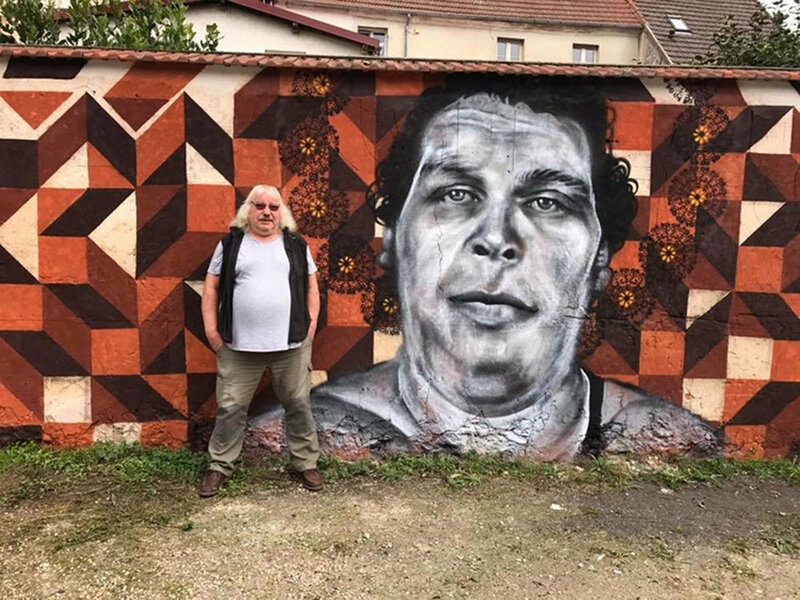 The André The Giant Mural Project was a collaboration with local artist, Moe Delaitre and youth from Ussy-sur-Marne, France, a small farm town forty-five minutes northeast of Paris. 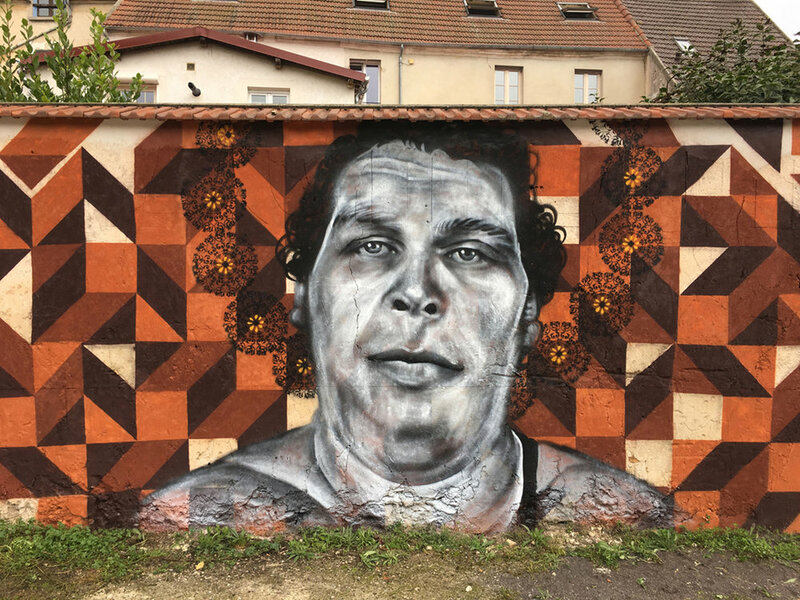 The subject of this mural, André René Ruoussimoff, aka André the Giant, grew up and is buried in Ussy-sur-Marne, beside his parents, and remains a legendary hero in the town. 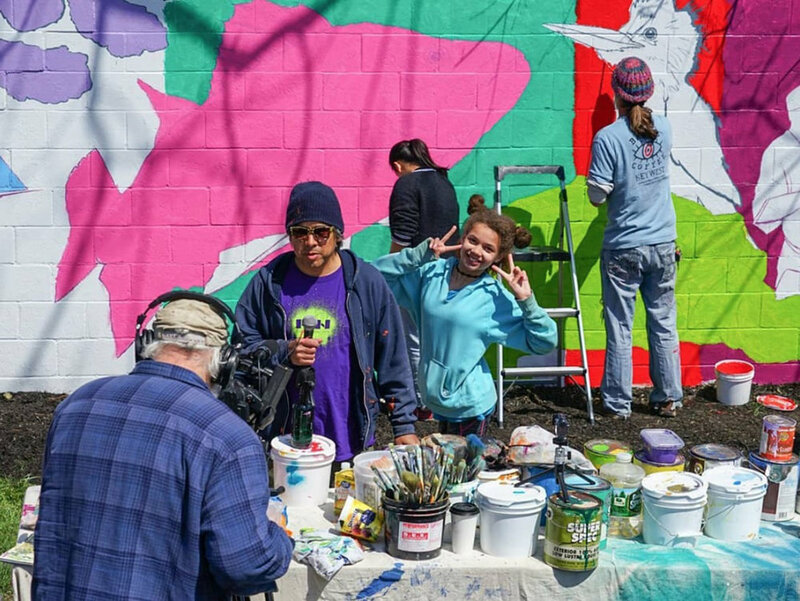 The Presidents Hill Mural Project was a collaboration with Jóvenes Artistas, a local after school arts program serving kids from underserved communities. 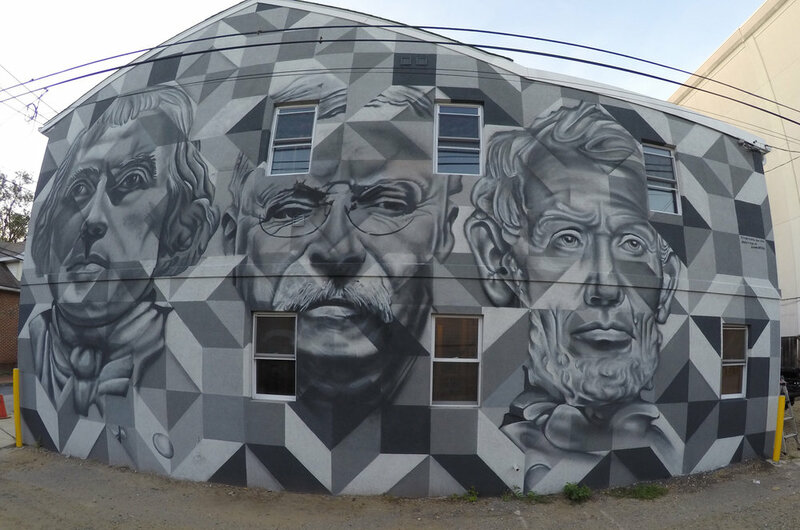 In this project, located in the Presidents Hill neighborhood of Annapolis, we painted a mural that combines American History (portraits of James Madison, Theodore Roosevelt and Abraham Lincoln), geometry, and a stencil application. 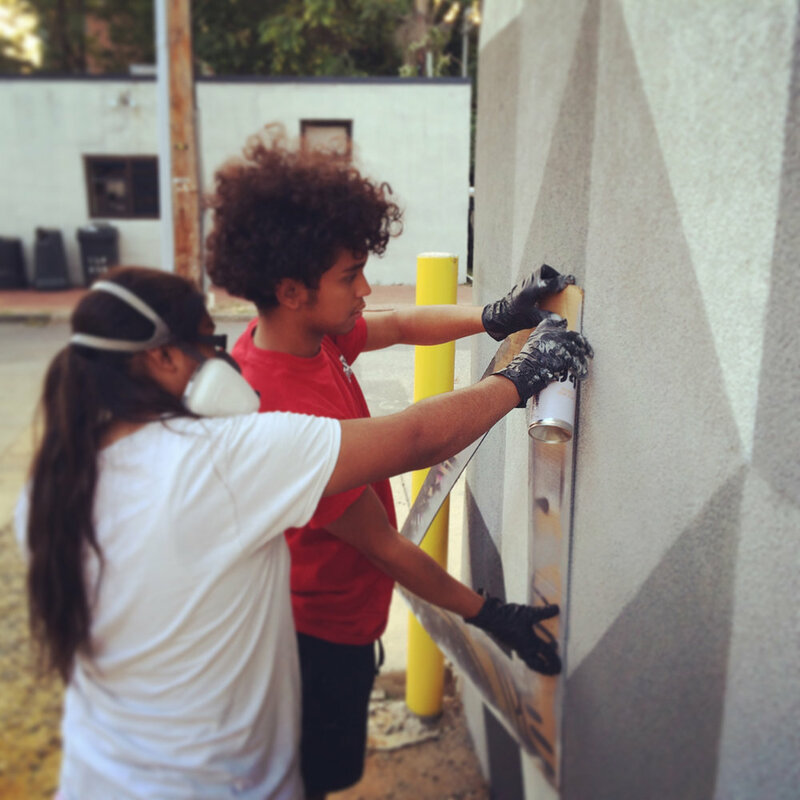 Every geometric element in this painting is divisible by a 24” triangle cut out of a single piece of cardboard stencil, and 4 shades of grey spray paint. 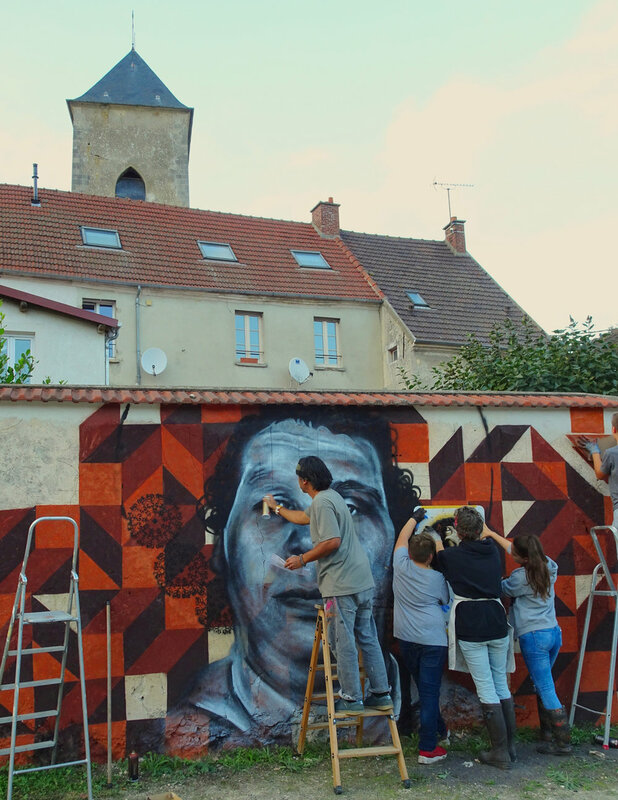 By manipulating the triangle positions and the 4 tonal values of paint, we created a 3-D effect with the background pattern to contrast the historical subject matter. 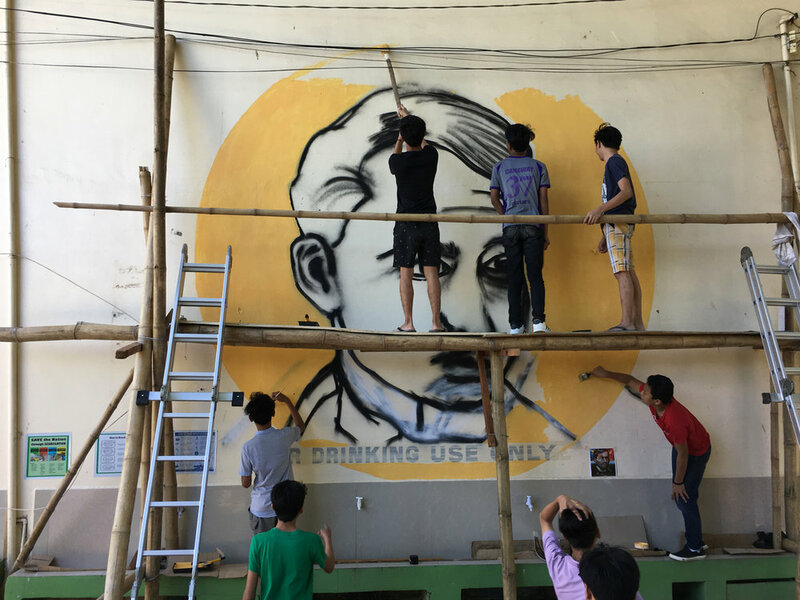 Hence, Future History Now. 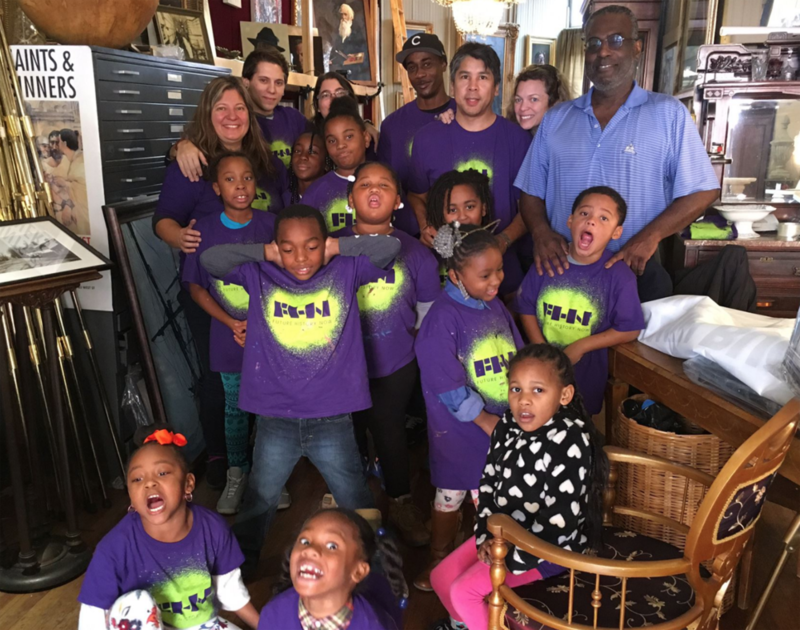 Future History Now is a 501(c)(3) organization. 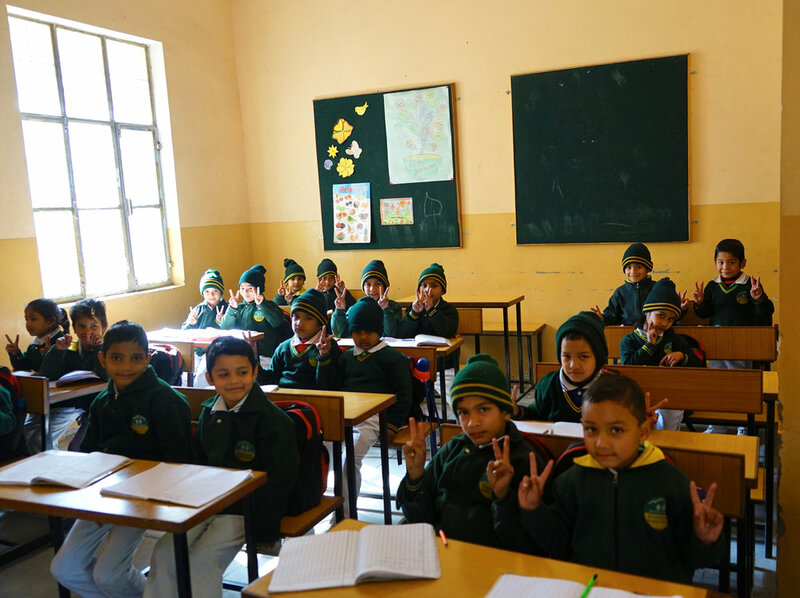 Determination letter.